Historically, Canadians have thought themselves morally superior to Americans. It has been this way since 1867, when we became Canadian, largely out of fear that if we did not we would become American. Feeling superior today allows us to believe we are immune to the kind of populism convulsing the United States and Europe. We're different, we assure ourselves, more moderate and progressive. It can't happen here. Doug Ford, the new leader of the Progressive Conservative Party of Ontario, tests our self-awareness. Will the wealthiest, most populous province in Canada embrace his brash, bombastic politics? Suddenly, Ontario is the newest petri dish of populism. Doug Ford is crude, ignorant and swaggering. He is short on policy and long on rhetoric. The comparison with Donald Trump is imperfect but both are rich and egotistical, with no real experience in politics before running for the top job. The premiership, like the presidency, is an entry-level position. Their laments: Taxes are bad. Governments are wasteful. Politicians are corrupt. If you want a guy on horseback, here I am. Canada is not the United States. Still, as pollster Frank Graves argues, there are similar forces stirring in Canada's industrial heartland and beyond, in its vanishing heavy industry, displaced workers, opioid crisis, income inequity and distrust of élites. We have long told ourselves we are more liberal, more peaceful, more tolerant. Canada has universal health insurance. It has a generous social safety net. Money does not shape its politics and religion does not influence its government, which Canadians believe has a legitimate role in their lives. We have long told ourselves we are more liberal, more peaceful, more tolerant. We believe we are less violent, less religious, less ideological. We have avoided slavery and misadventures such as Vietnam and Iraq. We had no civil war and no (major) civil unrest. We have no colonies. We have always fought alongside others, never alone and never in wars of conquest. We rejected nuclear weapons and we were pioneers of peacekeeping, which we saw as our international vocation in the Cold War. In social and economic measures, there's an argument that Canada is a more successful society than the United States. (A prominent Canadian journalist is writing a book saying just that.) After all, who doesn't want to think that you're better? In the shadow of Trump's America, our self-confidence grows. Canadians see a country led by a president who is protectionist, isolationist, nativist, nationalist and conservative. By contrast, we embrace free trade, open immigration, collective security and interventionist government. We accept regulation and entertain Pharmacare. Abortion, capital punishment, gay marriage and assisted suicide are largely settled here. Is it true? Are we a more successful people? And are we less prone to an ugly populism? Given Ford's weekend victory, you would think not. We are reminded that Toronto, the largest city in Canada, elected Doug's brother, Rob. We are reminded that no one saw Trump coming. Few pundits will declare that Ford cannot be elected premier of Ontario. Under the right conditions, he can. If voters are fed up with the Liberals. If the personal antipathy toward Kathleen Wynne, which is irrational, holds up in a real contest. If Ford persuades voters, as Trump did, that he is a change agent. In election campaigns, the unexpected happens. It's why Justin Trudeau took a third-place party to majority government in 2015. After 15 years of Liberal rule in Ontario, history is against incumbents; the "time for-a-change" argument will be strong this spring, even in a province with low unemployment. Doug Ford is a journalist's dream. Watch for the New York Times – which is covering Canada with refreshing energy and imagination – to run a prominent profile any day on "Canada's Trump," making the irresistible comparison with you-know-who. 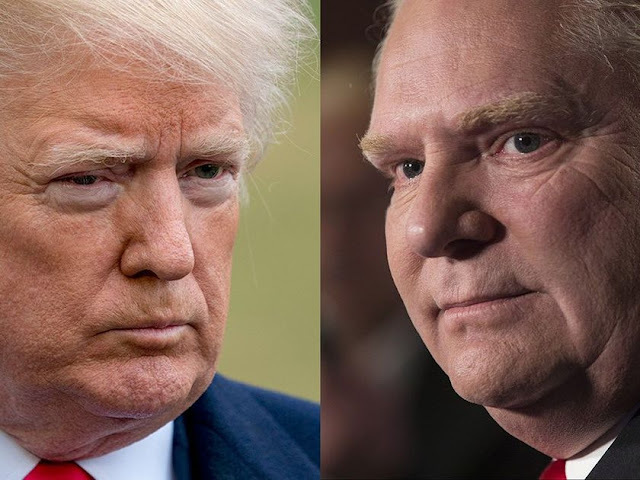 Given Trump's success in 2016, no one can dismiss Ford. This June, in a watershed election that could reshape Ontario's electoral landscape, Canadians will show just how different they really are from Americans. Andrew Cohen is a journalist, professor and author of Two Days in June: John F. Kennedy and the 48 Hours That Made History.